The design skills and technical innovations of researchers at the University of Huddersfield have led to significant improvements in a silicon cooling cap that aims to reduce hair loss in cancer patients. Now, their contribution to the project has helped earn an international award. The cooling cap has been developed, manufactured and globally marketed by Huddersfield firm Paxman, which has formed close ties—including highly-successful UK Government-funded Knowledge Transfer Partnerships (KTPs)—with experts at the University, where scientists have established the scientific basis for scalp cooling in preventing hair loss during chemotherapy. And in the School of Art, Design and Architecture, lecturers Dr Ertu Unver and Dr David Swann have worked on major improvements to the design of the cap. 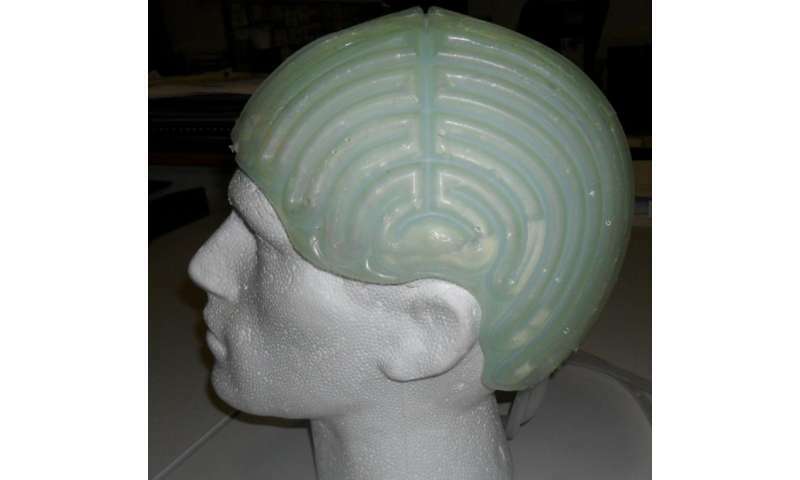 The latter worked closely with the firm Primasil Silicones in the creation of a silicone rubber formulation that gave the cooling cap greater flexibility and enabled the coolant running through the cap to be in close contact with the scalp. Now, at the 2015 Medtech World Awards, the scalp cooling cap design was declared the winner of the Exhibitor Innovations Competition. Dr Unver's brief was to redesign the cooling cap so that it is a better fit—vital if the device is to be effective—and can be mass-manufactured, making it more economical, aiding Paxman's global marketing drive. The cap that he and Dr Swann developed fits the head more efficiently, despite a reduction in the range of sizes from five to three. There has also been an improvement in the flow pattern of the coolant. During the project, Dr Unver carried out extensive research into head sizes and used 3D technology to develop a new design. Then, 3D printing was used to create a template for the production of cooling caps in silicon. He worked closely with Primasil and, in conjunction with the firm, two patents have been applied for. The cooling cap was also one of 46 finalists in the highly-prestigious INDEX: Design to Improve Life Awards, which received 1,123 entries from 72 countries. Now, the highly-fruitful collaboration with Paxman will carry on, as the firm seeks to make continual improvements to its cooling caps. The latest development is a new KTP—part-funded by government organisation Innovate UK—for which Dr Unver and Dr Swann are the academic and enterprise supervisors. The KTP associate, who will carry out research at Paxman's Huddersfield HQ and at the University, is a product design graduate and former student of Dr Unver, Chris Sorbie. He will work towards a Master's degree during the KTP.